It supports writing and reading of PLC MARKER, BYTE, WORD and DWORD values and machine parameters. 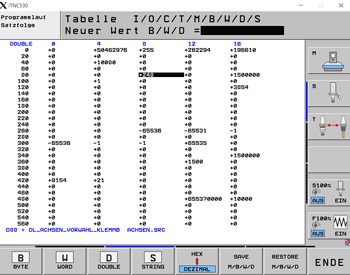 It also allows to convert PLC BYTE, WORD and DWORD output data read from older TNC 426 and 430 devices to match the values shown at the controller. 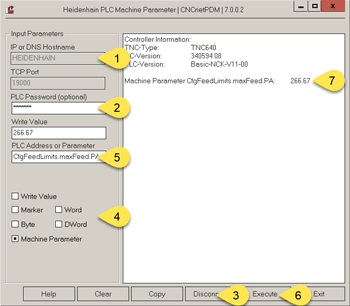 Make sure that you have an Ethernet network connection between your PC and the machine and get data, use our Heidenhain Machine Data utility to do so. Download writetncplc.zip and extract all files to a folder of your choice on your PC. Double click HeidenhainPLCRW.exe and enter the IP Address or DNS Hostname of your controller (1). Input a PLC address or machine parameter (2) name you’d like to read values from or write values to. Select one of the PLC areas or the machine parameter area, here Parameter (3). After clicking button [Query] (4) the program tries to connect to your controller and read or write the requested data. If successful, the program outputs the result of the operation in the area at the right (5). For PLC data you get M for MARKER, B for BYTE, W for WORD or D for DWORD + address = value. To write a PLC address value or a machine parameter you have to enter the desired value under ‘Write Value’, activate checkbox ‘Write Value’ and click button [Execute]. If successful the program outputs the result of the write operation in the area at the right. For testing it is usually safe to write data to MARKER, BYTE or WORD address 1. For DWORD you may use 24. If you change machine parameter 3515 please reset it to its original value afterwards. In any case it is recommended to verify that PLC addresses or machine parameters you intend to write values to for testing are NOT used for production tasks at the machine! To verify the result of a write operation you can simply deactivate checkbox ‘Write Value’ and click button [Execute] to check the actual value. If you read or write a WORD address value the PLC address has to be divisible by 2 e.g. 490, 492. If you read or write a DORD address value the PLC address has to be divisible by 4 e.g. 360, 364. In case of writing a MARKER address value you have to enter either 0 or 1 as ‘Write Value’. If you read BYTE, WORD or DWORD values from an older TNC 426 or 430 controller it may be required to activate the ‘Swap’ checkbox to get correct results. Activating ‘Swap’ has no influence on writing. If you have installed CNCnetPDM on your PC with a license other than a ‘free license’ and run this program from the folder where CNCnetPDM is installed you get unlimited functionality. With a free license you can read PLC address values or machine parameters. Writing of values is not supported in this case. Please see licensing for details or contact us if you have any questions. Below the image you can find some useful machine parameters that can be written and read to/from Heidenhain iTNC 530, TNC 426 or 430 devices. For PLC addresses please refer to this section. If you can ping the controller but get a ‘Connection to IP Address port 19000: Failed!’ please verify that there’s an exception for port 19000 in your firewall. Use our tool Device Port Scanner to check that your controller is reachable via that port. If you still cannot connect to the controller please make sure that LSV2 access is not locked at the controller, see ‘Controller Setup’.